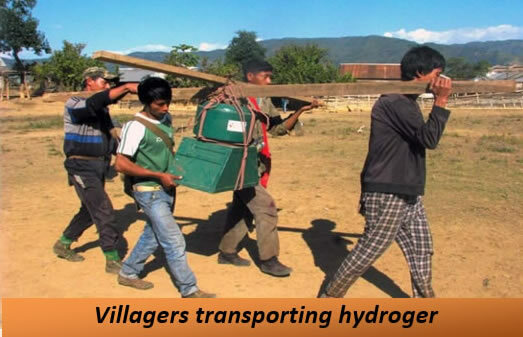 Pang is a village of 94 households, situated along the Indo Myanmar border about 150 kms south east of Noklak with a coordinates of N-25° 56’ 19”, E-094° 57’ 40”. The village has been connected by road only as late as of Sept’ 2013. NEPeD’s Energy Team installed a 3Kw hydroger in the first week of Dec’ 2013. Community participation was tremendous in all facets of installation, from the cutting of the power channels, digging and de-silting the forebay tanks, erecting and setting up the transmission lines and the construction of the power house. The Rural engineers from Kingjung village did a remarkable job in laying the transmission lines and electrifying the households. They also helped NEPeD to identify the energy committee members to whom basic training was imparted. 2. Change in mindset of the community, social bonding, and happiness quotient up. 3. Villagers learn to share the power generated. 4. NEPeD’s intervention on women empowerment, health and sanitation, decision making and child care. 5. Children have longer study hours. 7. Awareness created on protection of the bio-diversity and catchment areas. 8. NEPeD energy committee created with involvement of women representatives. 9. Revenue generation for operation & maintenance of the hydroger/ salary component of the operators.